On Monday, April 15th, join Dr. Mark D. Roseman with the Toby Center and Luxury Chamber of Commerce for a meaningful evening of networking with celebrities, philanthropists and purveyors of luxury goods and services. This unique networking and charity event aims to connect like-minded philanthropists through forming valuable networks which inspire community and co-branding initiatives. The Toby Center is a 501(c)3 non-profit organization which offers a complete program of services for separated and divorced parents and their children including supervised visitation, family therapy, mediation and support. This fashionable yet mindful function will be hosted in The Mizner Room banquet hall inside Ruth's Chris Steakhouse in Boca Raton. Ruth's Chis is in the Boca Raton Office Building on the east side of Mizner Park. Patrons and donors will enjoy a mini fashion show with designer Lis Castella and her models, mingling with celebrities and local notables, complimentary Lamborghini brand champagne, one complimentary cocktail, appetizers, a cash bar and door prizes. Event photos will be published in South Florida Magazine's May 2019 issue. Location: Ruth's Chris Steakhouse – 225 NE Mizner Blvd. Please contact Jay Shapiro jay@southflorida.in for more information. On Monday, March 18th, join Never Start and Luxury Chamber of Commerce for an inspirational evening of networking with celebrities, philanthropists and purveyors of luxury goods and services. This unique business networking event aims to connect like-minded philanthropists through forming valuable networks which inspire community and co-branding initiatives. Never Start is a 501(c)3 non-profit organization with focuses on smoking and vaping prevention by providing students with multiple channels of expression including song, dance, sports, technology and the arts. This fashionable function will be hosted at the on-the-water patio of Artisan Beach House inside Ritz Carlton Bal Harbour. Guests will enjoy mingling with celebrities and local notables, a complimentary glass of champagne, a cash bar and door prizes. Event photos will be published in South Florida Magazine's April 2019 issue. Please join us in welcoming skincare and cosmetics CEO Samantha Jagroop as our new membership director. enthusiasts will celebrate with Marque of the Year, Bentley Motorcars on their 100 th Year Anniversary. / 501 East Camino Real in Boca Raton. Ristorante; Taverna Opa; Potions in Motion; Café Med; Seasons 52 and more. performance by one of the most respected and successful comedians in the country, Jay Leno. of TV Show Chasing Classic Cars for an intimate brunch with a Q&amp;A session. ($1,000 per person). over 20 of South Florida’s finest restaurants at the Concours d’Gourmet Pavilion. vehicle to get a job, drive to school and all of the things we do every day with an automobile. his technique featuring atmosphere and interaction which allows you to see every automobile at its finest. 1998, Rowe has created posters for the Pebble Beach Concours d’Elegance. Cabriolet; 1930 Packard, Model 734S (debut). full schedule of events, please visit www.bocaCDE.com or please call (954) 537-1010.  (Sunday) Guests can join Jay Leno and Wayne Carini for an intimate exclusive brunch with Q&amp;A.
early admission with Concours d’Gourmet access). 33309. For more information please call (954) 537-1010 or view the website at www.bgcbc.org. commitment to delivering a peerless experience through customer-focused sales and service processes. additional information about the Company, its business, and its results of operations. November 16-18 2018, Friday 3:00 pm - 9:30 pm Saturday Noon - 9:30 pm Sunday Noon - 7:30 pm South Florida’s largest residential improvement expo returns to Fort Lauderdale offering thousands of home and garden products and services. Find the latest trends, get expert advice, compare and purchase while finding special offers exclusive to the show! Enjoy some craft therapy with Linda Phan of HGTV’s Property Brothers at Home: Drew’s Honeymoon House. Linda will present seminars and demos: “Table Talk” and Q&A on Saturday, November 17th and “The Wishing Wreath” on Sunday November 18th. Enjoy daily lifestyle seminars; Family Day art activities presented by Broward County Parks and Recreation; and designer room vignettes created by Martha Antonini, Francy Arria, Perla Lichi, and Viviana Galetto in collaboration with Special Spaces. Featured Interior Designers offer décor and design inspiration and advice all weekend. New to the Home Show: “Ely’s Special Space”: a designer room showcase inspired by a teenage boy diagnosed with malignant bone cancer and the next recipient of a Special Spaces Boca Raton bedroom makeover. For information and updates, visit www.homeshows.net and follow on social media for updates @FLHomeShows #FLHomeShows. Purchase tickets online by Friday, November 15th and SAVE $3.00. The Citation Excel is immediately available for charter. The aircraft is based in Atlanta, GA (PDK) but will float and is easily positioned for true, one-way pricing. The addition provides another mid-size jet to their steadily growing fleet of light, mid-size, super-mid and heavy jets. The addition of the aircraft poses Jet Access Aviation as the largest operator based in the Southeast. “We strongly believe our dedication to unparalleled communication and customer service is driving our customer demand which is a key element in our growth and fleet expansion” said Jet Access Aviation’s Founder and President, Jack E. Lambert Jr. The Citation Excel can climb to its altitude in just eighteen minutes and can cruise at 423 knots and boasts the shortest takeoff distance of any midsize jet. The Citation Excel holds seven passengers in a cabin that’s equipped with Wi-Fi and an entertainment system. Jet Access Aviation is an ARG/US Platinum and Wyvern Approved worldwide charter operator and aircraft management firm adhering to the strictest safety standards. Jet Access helps connect business travelers with easily accessible aircraft and specializes in the floating fleet model which offers one-way private jet charter flights. The company’s fleet consists of a variety of aircraft which include a Challenger 604 and 605, Gulfstream G200s, Falcon 2000s, as well as Hawker 800XPs, Lear 60s, Citation Excels and several Light Jets. For more information about Jet Access Aviation, please visitwww.jetaccessaviation.com or call (561) 283-1214. Miami Beach, Florida: From July 12th-16th 2018, Swim Week powered by Art Hearts Fashion transformed South Beach into a swimwear wonderland. Designers, buyers, and industry professionals from around the world flocked to Miami Swim Week’s annual swim and resort wear event. Art Hearts Fashion expanded its footprint as the largest producer of runway shows during Swim Week. With over 33 top tier international designers and a rare first-time collaboration with luxury retailer Saks Fifth Avenue, Art Hearts Fashion celebrated the sexiness and excitement that is Swim Week at the world class Faena Forum. “This was by far the biggest production this season for Swim Week in Miami in terms of size and scale”, said Erik Rosete, Founder and President of Art Hearts Fashion International. “We had a record number of designers presenting along with the most leading brands in the industry including several designers carried at Saks Fifth Avenue”. Attracting over 10,000+ attendees, Miami Swim Week powered by Art Hearts Fashion was a massive undertaking that truly represented the City of Miami. 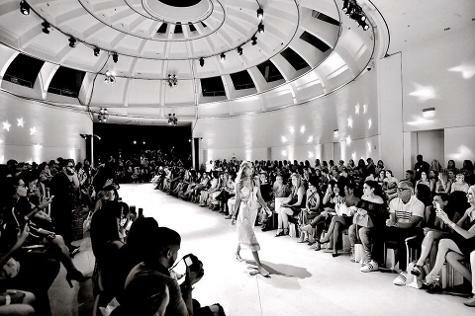 The massive event spanned across the city with runway shows at the renowned Faena Forum and special events at exclusive locations including E11ELEVEN Miami, and Saks Fifth Avenue. “We wanted to showcase the diversity, fun, and sexiness that are indicative of Miami and swimwear.” Rosete said. The vast event drew an eclectic group of celebrities including, but not limited to, Ryan Phillippe, Soccer Star Eduardo Salvio, NFL Super Bowl Winner Devin Thomas, Male Super Models Tyson Beckford and Garrett Neff, Cast Members of Love and Hip Hop Miami and WAGS Miami, and Carmen Carrera, the first transgender model to ever walk the runway for Swim Week. Sponsors & Partners included: Saks Fifth Avenue, Executive Styles, Principessa Prosecco, Bioderma, BoConcept, Andrew Steven Shoes, Style The Runway, April Love Pro Team, Health-Ade Kombucha, Monster Energy, Fashion Week Online, Apparel News, Sotheybys, Tiffany Wax, and more. Established since 2011, ART HEARTS FASHION is a forward-thinking and innovative fashion platform that is breaking new ground with cutting-edge runway presentations in New York, Los Angeles, Miami, and Asia. The visionary productions have garnered national and international acclaim from fashion authorities including, but not limited to, Harper’s Bazaar, Vogue, WWD, Cosmopolitan, Popsugar, and Refinery29. It has attracted mass media coverage by major outlets such as Today Show (NBC), Fox Television, CBS Television, Amazon Prime, The Huffington Post, and numerous digital and cable networks throughout the world. As of 2018, Art Hearts Fashion produces the #1 Los Angeles Fashion Week, #1 Miami Swim Week, and is in the top 3 New York Fashion Week Productions. ART HEARTS FASHION has amassed an A-List Celebrity following that includes Oscar Winner Adrien Brody, Britney Spears, Kelly Rutherford, Nick Cannon, CeeLo Green, Drew Barrymore, Kelly Bensimon, Curtis Young “50 Cent”, Jason Derulo, Male Super Models Tyson Beckford and Garrett Neff, Lindsey Lohan, Philip Bloch, Steve Madden, Adam Dell, and Christopher Forbes. Consisting of 4-days of unrivaled shows, the highly sought-after event has a daily attendance of over 1,500 guests, celebrities, fashion editors, stylists, influencers, media, and VIPs. Lake Worth, FL, June 18, 2018. – Luxury Chamber of Commerce is pleased to announce a networking event taking place at a new concept art bar, Sugar Plum & Grumbling Growler located on bustling Lucerne Avenue in the heart of downtown Lake Worth, FL The event will present an opportunity to network with purveyors and consumers of luxury goods and services as well as design industry professionals including: interior designers, fashion illustrators, artists, architects, jewelers and digital designers. Sugar Plum & Grumbling Growler melds four businesses into one: wine bar, craft beer pub, an art gallery and a unique event venue. The Grumbling Growler side serves as a craft beer bar featuring over 30 craft beers both bottled and drafted (with plans of growing to over 100 in 2019) along with an attached outdoor beer garden in the rear for live music and a boutique wine bar featuring estate wines and organic wines from around the globe. The Sugar Plum Art Gallery side of the business is an art gallery where you can explore international and local artisans while sipping on your favorite wine or craft beer. Event attendees will enjoy mingling with local notables including Plumb Talk Production's Dr. Shelley Plumb who is co-charing the event, live acoustic guitar, a complimentary glass of wine and Lamborghini brand champagne as well as paired hors d'oeuvres. Patrons will know they have done the right thing by attending as a percentage of proceeds goes directly to Forgotten Soldiers Outreach which is a 501(c)3 organization sending care packages and letters of encouragement to deployed troops. Learn more about SPANDGG at www.spandgg.com and follow them on social media. West Palm Beach, FL Luxury Chamber of Commerce is pleased to announce a networking event taking place Monday March 19th 2018 at at Palm Beach Harley Davidson. The event will present an opportunity to network with purveyors and consumers of luxury items and big boys toys i.e. motorcycles, cars, boats and jets. Palm Beach HD has the largest inventory of any Harley dealership in Florida and is owned by the esteemed Veracka family of motorcycle enthusiasts who own some of the top dealerships in the country. Event attendees will mingle with celebrity guests, enjoy complimentary beverages as well as appetizers, and have the ability to network with the general managers of local luxury businesses as well as consumers and brand aficionados. Patrons will know that they have done the right thing by attending as a percentage of proceeds goes directly to Food for the Poor which is a 501(c)3 organization. Boat buyers took to the docks from February 15-19 at the 30th annual Miami Yacht Show, garnering positive feedback from exhibitors about the enhanced show experience and the strong quality of sales leads. The annual event attracted a global audience to a spectacular display of yachts and marine products, including more than 500 new and brokerage yachts and the latest marine technology and accessories. For the third year, the show also included a display of superyachts on Watson Island at Island Gardens Deep Harbour marina, known as Superyacht Miami. According to exhibitor Bob Denison, President and Founder of Denison Yachting, "The Miami Yacht Show was solid. We saw very strong numbers from Hatteras and a few deals at our brokerage display. I'm happy to also report a Sanlorenzo 112 sale that occurred on the docks over the weekend. We're very happy with results." "Miami has a unique appeal as a destination for yacht buyers from around the nation and the world who enjoy attending the show at this prime time of year," said Andrew Doole, general manager of Informa, the Miami Yacht Show's co-owner and producer. "This year's show fared well overall in terms of operations, as well as exhibitor and attendee participation, and we now have exciting plans to support its continued growth." The in-water yacht show, co-owned by Informa and the International Yacht Brokers Association (IYBA), covered more than 1.2 million square feet of space from 41st Street to 54th Street along the Indian Creek Waterway. "We were fortunate to have beautiful weather and the caliber of the client was excellent," said IYBA Vice President Paul Flannery. "I had reports from several exhibitors that they enjoyed success and expect to see more business in the days to come as a result of their encounters at the show. The Miami Yacht Show remains one of the most important shows of the year and with changes for 2019 in the making, we expect it will continue to be critical show for the marine industry and new buyers." For exhibitors with news to announce, the show provided a valuable platform for reaching buyers. "The 2018 Miami Yacht Show was the perfect place for the new RMK Merrill-Stevens to make its Miami debut. The show gave us the opportunity to reunite with loyal clients and expand relationships with new owners and vendors. We found that customers were eager to learn more about the growing strengths of the yacht industry in Miami," said, RMK Merrill-Stevens President and CEO Aaron Leatherwood. "We were also very excited to announce that we're adding a 100-ton lift this year, in addition to the state-of-the-art 2,700-ton shiplift that's under construction." Noted Roger Moore, CEO of Nautical Ventures, which hosted the show's first ever AquaZone demonstration area, "This was our best show on Collins Avenue with our highest traffic count in the last three years. "From show set-up to sales, this year set the bar high. We had record sales with an over 80 percent sell- through rate, and we have more quality prospects for post-show follow-up than in previous years. We are very pleased." Two different boat shows took place concurrently in Miami and Miami Beach during Presidents' Day weekend. Informa manages, produces and co-owns the Miami Yacht Show. The Miami International Boat Show on Virginia Key is owned and operated by the National Marine Manufacturers Association. "It was apparent that additional investments were made to make it easier to commute between the various locations of the show and provide options for an ultra-luxurious experience," said Sally Doleski, vice president of marketing at Ocean Alexander. "The Miami Yacht Show is becoming one of the most important shows for us as a yacht manufacturer and we're excited about all the future possibilities for growth." Sunreef Yachts, which drew significant interest among potential buyers for its new Supreme 68 power catamaran, called it "a very quality show for us." Said company PR and Marketing Director Karolina Paszkiewicz, "We will definitely come back next year." Informa Exhibitions has announced that the Miami Yacht Show will move in 2019 to the area located just north of downtown Miami where the Miami Herald building once stood and Sea Isle Marina is currently. The show's product mix will continue to feature new and brokerage yachts, with the added benefit of more on-land exhibit space for luxury components such as exotic cars and aircraft. Ease of access and proximity to the Miami International Boat Show (MIBS) will make it more convenient for attendees to experience both boat shows on one day than it has been since MIBS moved from the Miami Beach Convention Center to Miami Marine Stadium on Virginia Key in 2016. The new Miami Yacht Show location, between the Venetian and MacArthur causeways provides vastly increased parking with approximately 3,500 spots. In addition, water taxi transportation will connect the 2019 Miami Yacht Show to Superyacht Miami at Island Gardens Deep Harbour marina. The 2019 Miami Yacht Show will run Wednesday, February 13 through Sunday, February 17. Previously, the show ran each year from Thursdaythrough Monday during Presidents' Day weekend.